How to Recover Data from Broken Android Phone for Free? Home > Android Recovery > How to Recover Data from Broken Android Phone? Are you looking for a way for Android broken screen data recovery? By accident, you dropped your Android phone to the ground or a stone, unfortunately, the screen was broken. To make matters worse, due to a touch screen failure, you could not unlock the phone and access the data inside, such as contacts, messages, photos, videos, chat history, etc. In that case, you were definitely very anxious and wanted to find a way to quickly retrieve data from the broken Android phone instead of throwing it away and giving up all the precious data. Have no idea of how to recover data from an Android phone with broken screen? You can follow the instructions here. AutoPlay is an easy way which occurs in one’s mind to get data off Android devices. Please follow the steps below to recover your phone data to the computer. Step 2: An AutoPlay will pop up on the PC once your mobile phone is recognized. Just click the “Open folder to view files” option. Attention here, you can’t recover contacts from Android phone as well as SMS, WhatsApp, etc. in this way; but they are so important that nine out of ten persons don’t want to lose them. No worries, the best Android data recovery software of Gihosoft, so far as I know, will help you out there for free. Please sit tight and read the following tutorial patiently. Gihosoft Android Data Recovery Free software has won a good reputation among users. 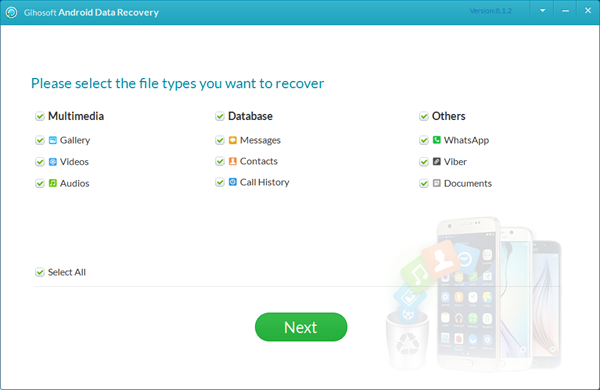 No matter is for accidental deletion, device formatting, restoring to factory settings, rooting, system error or virus invasion, it has an ability to recover data like text messages, contacts, WhatsApp, Viber, photos, video and music from Android phones. More importantly, it is compatible with Android smartphones and tablets of all brands such as Samsung Galaxy S10/S10+, S9/S9+, S8/S8 +, Huawei P30/P30 Pro, P20/P20 Pro, HTC U12/U12+, LG G7 ThinQ, Google Pixel 3/3XL, Motorola Moto G7, etc. Step 1: First of all, you are supposed to download Gihosoft Android File Recovery software for Windows or Android Data Recovery for Mac. Afterward, install the software and launch it on your desktop, the interface below will pop up right after clicking it for twice. Step 2: Connect your Android phone to PC after clicking “Next” and make sure your phone USB debugging mode was toggled on. Step 3: With the program recognized your Android phone, please click “Start” to scan and search for the files you want to get back. 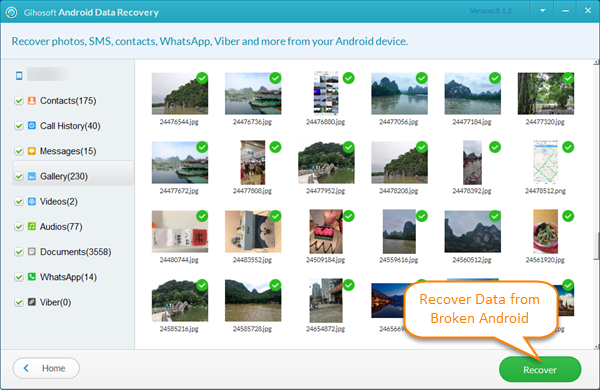 Step 4: Preview the files you selected to recover, then click “Recover” to retrieve data from your broken Android phone. How to recover data when the phone touch screen is completely dead without turning USB debugging mode on? The above two solutions are for those whose broken phone just lose partial touch functionality so that they can open the USB debugging mode. However, if your phone totally loses touch functionality and becomes unresponsive, you may use Android Device Manager to remotely unlock your screen with ADM functions enabled, or use other ways to access your phone data by operating your Android screen on PC so as to get USB debugging mode. Based on the comparison of the methods above, Gihosoft Free Android Data Recovery may not be the best software to some extent, but it will securely offer you a reliable and easy-to-use experience for Android broken screen data recovery. Moreover, it can also recover data after factory reset Android phone.